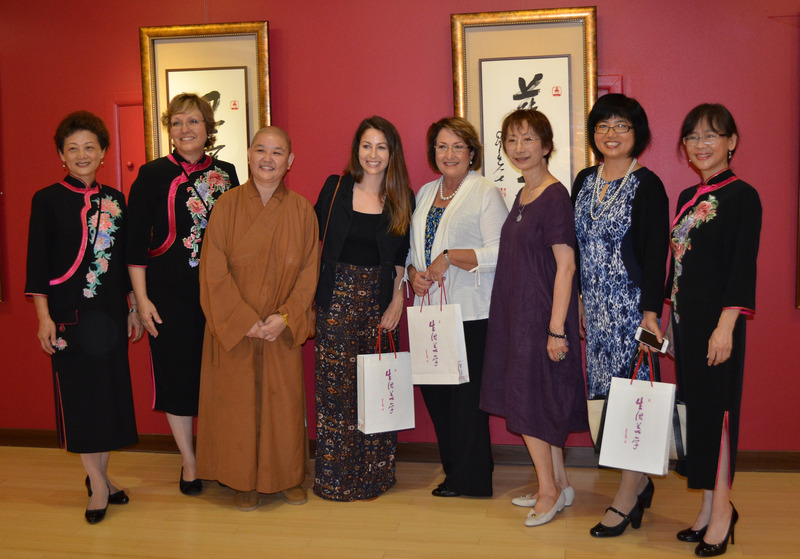 Mayor Teresa Jacobs recently visited the Guang Ming Temple in Orange County and took part in an official tea ceremony with the Venerable Chueh Fan. Central Florida’s Guang Ming Temple is a three-story, 30,000–square-foot traditional Chinese-monastic style temple that was completed in 2007. Guang Ming Temple was founded in Kissimmee in 1992 and is now the largest Chinese Buddhist temple in Florida. The Venerable Chueh Fan has graciously provided the invocation at the Orange County Board of County Commissioners (BCC) meeting on several occasions. During Mayor Jacobs’ visit, tea ceremony master Vicky Lu invited guests to a ceremonial tea ritual; a custom in Asian cultures that encourages visitors to savor the rich flavors of tea in a quiet, Zen-like environment away from the distractions of everyday life. Local citizen Judy Nguyen introduced participants to the different types of teas, tea aromas, and tea flowers. Guang Ming Temple is a traditional Chinese imperial style temple in Orange County located on Hoffner Avenue near Goldenrod Road. The temple provides multicultural education and serves as a center for social functions and festival activities. The temple has an authentic tea room and hosts Buddhism discussion groups and study classes, lessons on meditation and Chinese cultural programs. The Guang Ming Temple is a branch temple from Fo Guang Shan and means bright light in Mandarin Chinese. In May, Mayor Jacobs delivered a proclamation at Buddha’s Birthday Celebration at Guang Ming Temple. At the event, she encouraged all citizens to share in its observance by embracing the ideals of virtuous kindness, compassion, and wisdom. For 26 centuries the world has celebrated Buddhism and its principles of kindness, compassion and wisdom. Buddha’s birthday is recognized on the eighth day of the fourth month in the Chinese lunar calendar and is perhaps the most colorful and festive of all the Buddhist holidays. A collection of photos from the tea ceremony at Guang Ming Temple are available on Flickr for use by the media.